Spend a week or longer in this charming, two bedroom, two bath condo on beautiful Sanibel Island. Our Condo is called Coquina Beach 4B and is in building 4 on the ground floor! Enjoy our condo in this tropical paradise surrounded by great beaches, shopping, golf, and restaurants. 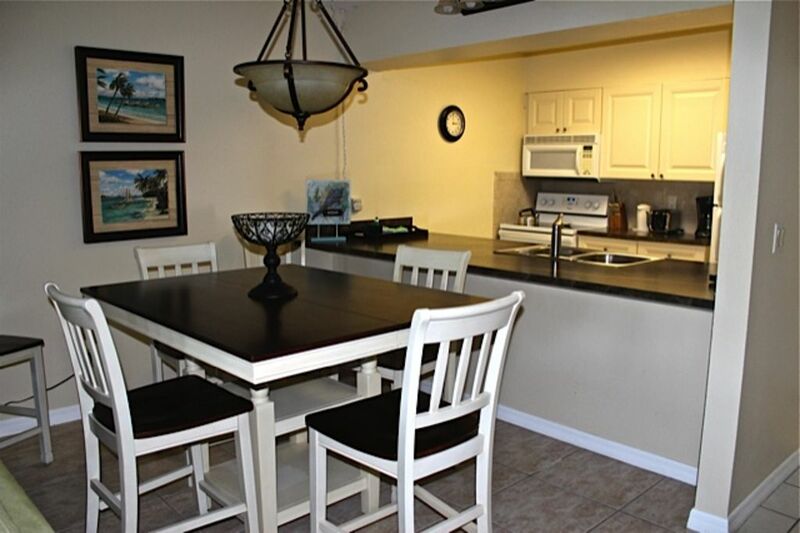 Our Condo is located in a very private, quite corner of Coquina Beach Condos ,which is an intimate upscale Gulf-Waterfront 40 unit complex with tennis, pool, picnic area, and barbeque grills. Staying here at Coquina 4B ,you are 20 steps to our refreshing pool and the beautiful sandy shell filled beach is 1 minute from the pool. Coquina Beach is located at the eastern end of Middle Gulf Drive and is just a short walk or bike ride to many favorite Sanibel locations. The condo was renovated in 2015, including both bathrooms, kitchen cupboards and appliances, and flooring in bedrooms. We have also upgraded every piece of furniture in the unit to to ensure that you have a welcoming, comfortable environment that is tastefully decorated for your enjoyment. The beds are all new within the last year. Plus we have three TVs: in the living room A new 60 inch Smart HDTV and both a 42in and a 48 inch TVS in each bedroom. We provide free wireless high speed internet access in our unit, plus we have 4 , YES 4 bikes in the storage lockers for your use and enjoyment as well. We also supply multiple beach chairs, shovels and buckets for shelling, tennis rackets/golf clubs and various other sporting equipment . With all these amenities we aim to save you on your vacation from packing your own, or spending excess money renting and saving precious time having all you needs meet - right at your fingertips in Coquina 4B . Enjoy a great vacation and take advantage of everything that Sanibel and Captiva Islands have to offer. We are very confident that ,while staying in our Coquina Beach Condo on Sanibel ,you and your family will make have an AMAZING HOLIDAY and make MEMORIES to last LIFETIME !!! We live in New York. 30 miles from NYC. After MANY Snowy winters in NY ,we'd rather be on beautiful Sanibel and hope to be there soon! We have vacationed on Sanibel for years. We keep returning for the beauty, the tranquility, and the tropical warmth, look and feel of the island.We have traveled to many tropical places and are blessed to have found Sanibel to be one of the nicest tropical settings all while staying in the USA!! We have tried to make our unit as welcoming to our guests as possible. We have renovated the inside, and upgraded virtually all of the furniture and fixtures to ensure your stay is as comfortable as possible. We have also added many guest amenities such as bikes, golf clubs, tennis rackets, pickle ball rackets, beach towels, beach chairs/umbrella and children's beach and pool toys, so that our guests do not need to bring, rent or purchase as much during their stay. toilet, shower, Master Bathroom, fully renovated in Nov 2013. All new! toilet, combination tub/shower, tub, Guest bathroom, fully renovated in November 2013. All new! Both bathrooms were gutted and completely re-done in late 2013. New shower stall in master bath, new tub/shower in guest bath, new sinks, toilets, vanities and flooring in both. Central Air conditioning throughout the unit. Fresh linens on beds when you arrive, plus additional linens in the closet for guest use if necessary. Available inside unit for guest use. Our unit is on a linen program, so towels are bathroom size only. If you prefer large beach towels, please consider bringing your own. NEW 60INCH HDTV, NEW FURNISHINGS . Definitely yes! Can't go without coffee! Lots of dishes for guest use. Three (3)NEW TV's in unit, One is new 60' HDTV flat screen , another NEW 46' HDTV in MASTER BEDROOM SUITE, another is NEW 40' flat screen IN SECOND BEDROOM. We have spare tennis rackets in our storage locker. PRIVATE Tennis court available STEPS AWAY. Heated pool on-site, about 30 second walk down garden pathway from condo front door. Lounge chairs, beach chairs, Umbrella, Shelling buckets, Sand toys, Tennis rackets, FIVE new bikes available for use and more. We had a wonderful time in this quiet oasis! We were lucky to have beautiful weather to enjoy the beach and pool and utilized the kitchen for dinner! Condo was clean and cozy and Ken was great to work with! We will definitely be back for a longer stay sometime soon! This is the perfect condo to stay in on Sanibel Island! It is updated and gorgeous on the inside. All of the rooms are large and spacious. The condo is steps away from the pool, beach, tennis court and bike paths, and is stocked with all of the essentials you would need to enjoy those activities. The pool is clean and has plenty of lounge chairs. The beach is pristine and is a great place to ride the waves, find shells, or spot dolphins! The tennis court is well kept and doubles as a pickle ball court. The bike path will take you anywhere on the island so your family can enjoy a safe ride together. The owners are wonderful and are so hospitable. They gave great recommendations of restaurants and fun things to do on the island to make sure that we had a great time. We cannot recommend this condo enough!! IF YOU WANT TO ENJOY ONE THE WORLDS MOST BEAUITIFUL BEACHES ,TO SEE LOTS OF DOLPHINS RIGHT FROM THE SHORELINE AND INCLUDING SHELLING, THEN THIS IS YOUR PLACE! OUR CONDO IS BEAUTIFULLY RENOVATED AND HAS EVERTHING YOU'LL NEED FOR A RELAXING HOLIDAY !